If you want to eat an entire lobster at a pocket friendly price, this is the place to be. Plus, everyone in London keeps talking about it, so you want to be able to chime in. There will be a massive queue. 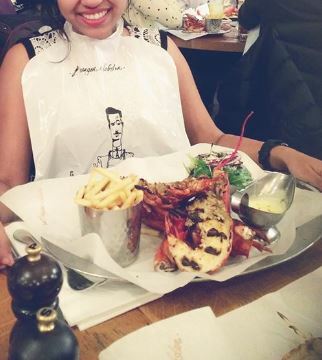 In spite of being a chain, each branch of Burger & Lobster is always packed with diners. What stands out the most when dining here is the number of fellow diners that are tourists and also how all of us grown ups are sat there in our bibs as we tucks into the juicy lobsters. This is not the place to come in your cocktail dress and killer heels in. You or someone else will manage to get lobster juice on your outfit, even if you do wear the bib. There is seating at the bar but it is better if you are able to sit in the banquette since the tables there are more spaced out and you can tuck in more easily into your lobster without worrying about elbowing fellow diners in the process. There is no food menu. The waitress simply recites the names of the only four dishes on offer i.e. the Grilled or Boiled Lobster, the Lobster Roll or the Burger and they cost the same – £20 each, which is really good value (that is, assuming you do choose the lobster and not the burger). 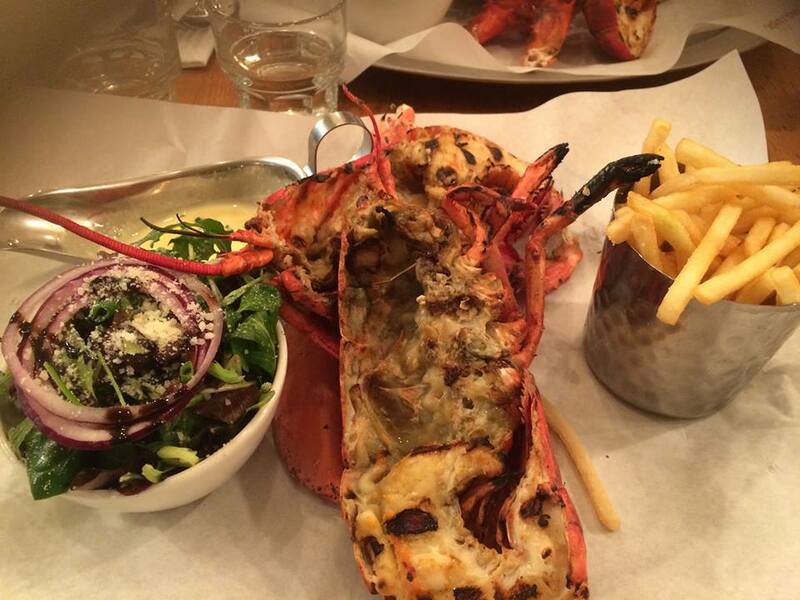 I ordered the Grilled Lobster which came with a big portion of chips and salad. The lobster in itself was massive and could have easily weighed about a kilogram. It was served with a garlic and lemon butter which helped enhance the taste of the fresh, sweet, white lobster meat. The chips were light and crisp but the salad could have done with a bit more of a body. I found mine to be too leafy and with not enough crunch and bite. There were some good cocktails on the drinks menu. I ordered the Abfab (not sure it does anything good for my abs though). It was made with peach liqueur, lemon verbana, red wine and fresh strawberries and was very refreshing following my lobster feast. Must visit for all those who love lobsters or those who want to try it for the first time. This is definitely one of the best Lobster selling eateries London has on offer both in terms of the taste and the quality of the lobster. Morever, it is suitable even for those on a shoestring budget. But be prepared to queue and to get in there with your hands when devouring the lobster- the cutlery only gets you so far! On the same lines, this place is definitely not recommended for a first date, unless you are sure your date will be very impressed with your ‘cracking’ skills on the lobster claws (sorry about the terrible joke) or is into the whole I-am-a-super-messy-easter look. This is one of very few places in London that specialises in gourmet seafood. Also, the place has an intensive, well-matched wine list. 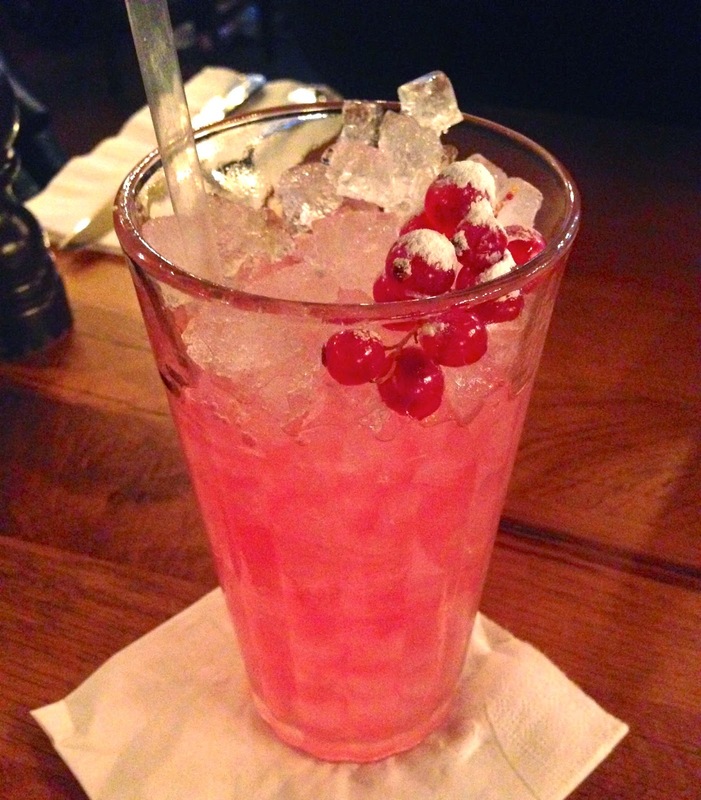 The small, white two-storey restaurant situated right opposite the Canary Wharf Hilton has a clean and sleek decor. I recommend sitting on the first floor with the all glass walls overlooking the skyscrapers in the neighbourhood. Due to the restaurant being off the beaten track, if you get there early on in the evening, you should be able to secure seats right by the window. The menu changes every few months but the dishes are always elaborate, with multiple elements and are beautifully presented. My starter of pancetta wrapped scallops was my favourite dish of the night. 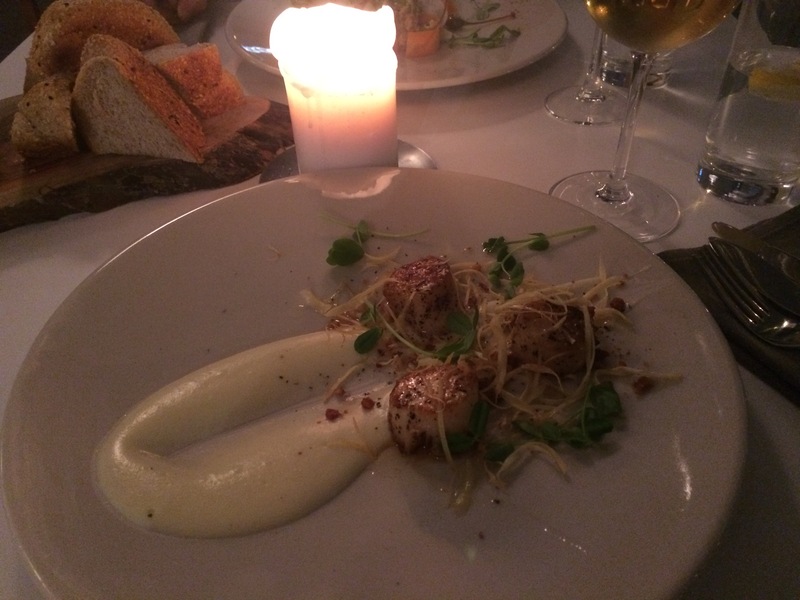 The scallops were fresh and juicy and the cauliflower puree was utterly smooth and creamy. The sea bass for my mains was served with barley risotto and laced with truffle foam. The garlic shrimps on the side added further to the texture. But I do feel that the excellently done sides did detract a bit from the main component, i.e. 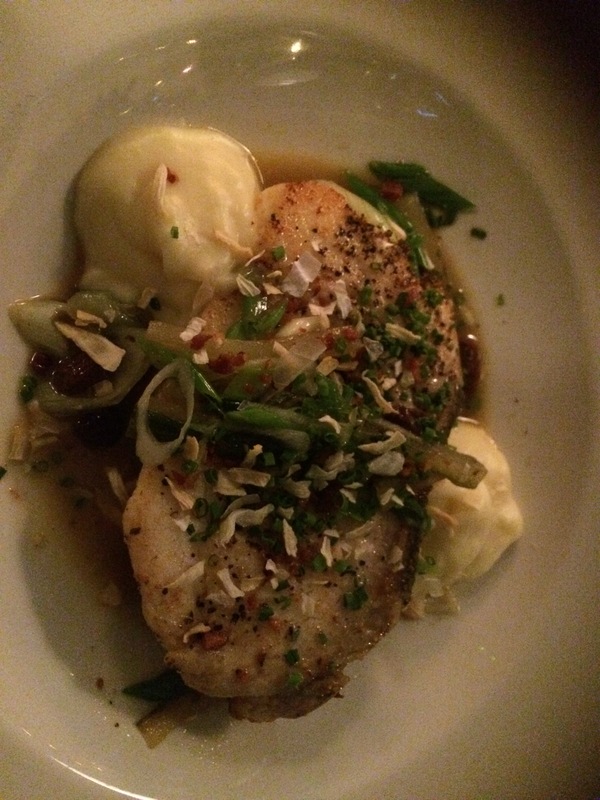 the sea bass, and specially because the latter is quite a delicately flavoured fish. 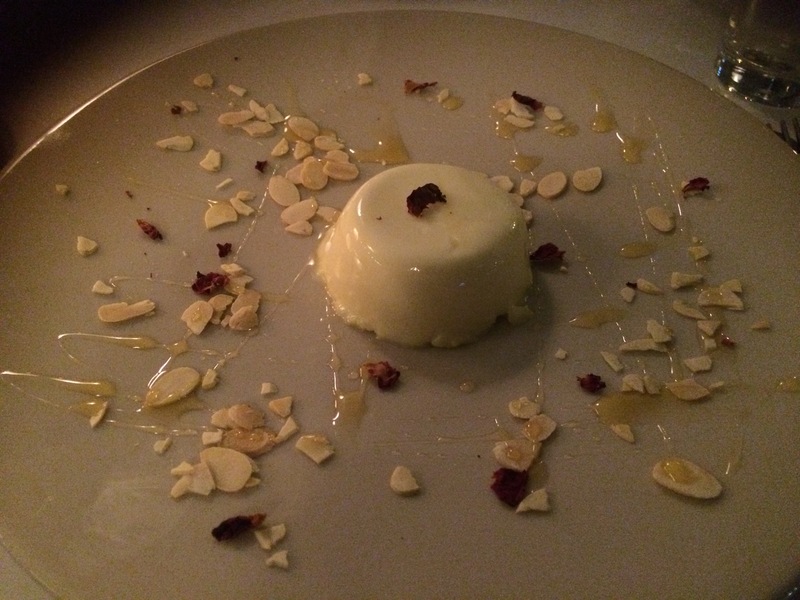 The coconut and almond Panna Cotta was a real treat to the eyes. But while it did taste great, I did feel a bit disappointed in the lack of experiment with the dessert offerings. If you like seafood and are bored of the standard fried or steamed fish dishes, this place to go!